Be the first to share your favorite memory, photo or story of William "Skip". This memorial page is dedicated for family, friends and future generations to celebrate the life of their loved one. 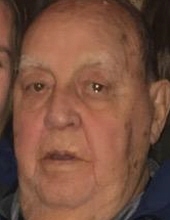 William “Skip” B. Ames, age 83, lifelong Macomb resident passed away on March 14, 2019 at Angelica’s Place in Romeo, Michigan. William was born in Hazel Park to Burton and Lillian (Frye) Ames. Skip had a 42 year career at Detroit Edison retiring as a customer business representative. He enjoyed all sports and local teams with a special love for the Detroit Tigers. William is survived by his sons Bill of Las Vegas and Tom (Heather) of Romeo; and grandchildren Molly, Gabriella, Isabella and Lillian. William was preceded in death by his wife Celeste Ames in 2004. Funeral services will take place on Monday, March 25, 2019 at 7 PM at the Henry M. Malburg Funeral Home of Romeo with Father Jerry Kesel officiating. Visitation will occur Monday, March 25, 2019 from 4 PM to 9 PM at the Henry M. Malburg Funeral Home. To send flowers or a remembrance gift to the family of William "Skip" B. Ames, please visit our Tribute Store. "Email Address" would like to share the life celebration of William "Skip" B. Ames. Click on the "link" to go to share a favorite memory or leave a condolence message for the family.